For a much better video of the geysers, click here. 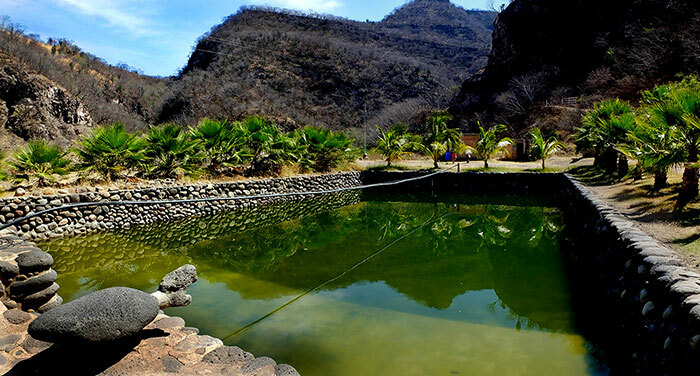 Visitors to Parque Ecológico Los Hervores relax in the “almost body temperature” pool. Other options are a very hot and a cool pool. 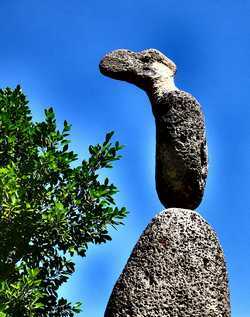 One of the many rock sculptures by Don Roberto Castro. 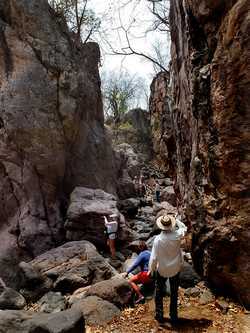 One kilometer from the thermal area there are places to hike along woodsy trails and through picturesque slot canyons. 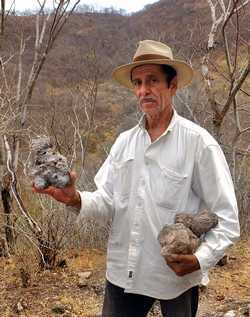 “We also have geodes here,” says landscape artist and sculptor Roberto Castro, who has been working for six years to turn a rough river bed featuring thermal activity into a park and camping site. “It’s 70 degrees,” says Engineer Luis Rojas dipping his fingers into a bubbling hot pot alongside Los Patitos River. A thermometer proved the temperature is actually 80 degrees Centigrade (176 Fahrenheit). 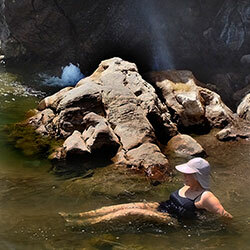 Maruca González finds the perfect spot in this mix of cold and hot river water. Strangler Fig (Ficus petiolaris) or Amate tree seen on the hike. 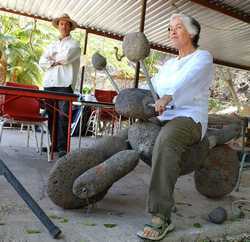 Maruca González tests out Don Roberto's Rock Motorcycle. Without a problem I found five friends ready to drop everything and yesterday we headed north along the road from Tesistán to San Cristóbal. This is now a divided highway, offering a magnificent view of a magnificent canyon and it conveniently skirts the town of San Cristóbal, in a few minutes bringing us to a turnoff signposted Ixcamilpa. What previously was a dirt road is now nicely paved and in only 20 minutes we arrived at our destination, which Google Maps calls “Campamento Huitztlán.” Here we found a big garden dotted with curious rock sculptures and lined with nice shade trees. Under one of them stood the owner of the place, Roberto Castro, who told me that his little paradise is called Parque Ecológico Los Hervores, “no matter what Mr. Google might call it.” He also referred to the river as the Cuixtla and the nearest pueblo as Atistique, even though I could find neither name on the maps I checked. As he spoke, my eye wandered to the curious stone statues all around us. There was a bird here, a crocodile there, a voluptuous goddess of sorts and even a motorcycle worthy of Fred Flintstone. We then took a tour of the place, starting with three swimming pools fed by hot springs. “Pick the one with the temperature you prefer,” said Don Roberto. All the pools were coated with green algae, but the water was perfectly clean and constantly circulating. 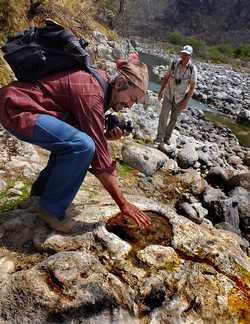 We walked only 280 meters to the riverside where geysers seemed to be hissing everywhere. Eventually we came to a natural “hot pot” where guests like to boil eggs. The water temperature was 80 degrees Centigrade (176 Fahrenheit). Don Roberto made the mistake of mentioning that there was a cave nearby. This resulted in a delightful 800 meter hike through beautiful woods and dramatic arroyos. The cave turned out to be a long fissure where we spotted a few vampire bats. 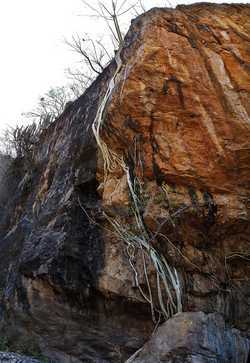 We also saw several strangler figs clinging to sheer rock walls as well as a stone wall which Don Roberto said had been constructed in preHispanic times. Birdwatcher Chris Lloyd spotted 15 birds that afternoon, including a motmot, a Mexican trogon (pájaro bandera) and a common black hawk. The hike put us in the mood for a soak in the “nearly body temperature” pool which, later, no one wanted to leave when it was time for us to go back home. As this charming oasis can see up to 100 visitors on a weekend, I suggest you come on a weekday. Just about any kind of car can easily reach the place. From Monday to Friday the cost is 50 pesos per vehicle. Don Roberto sells cold beer and refrescos, but not food and, yes, overnight camping is allowed. Don Roberto’s Cell is 333 451 0423 and he speaks a little English. 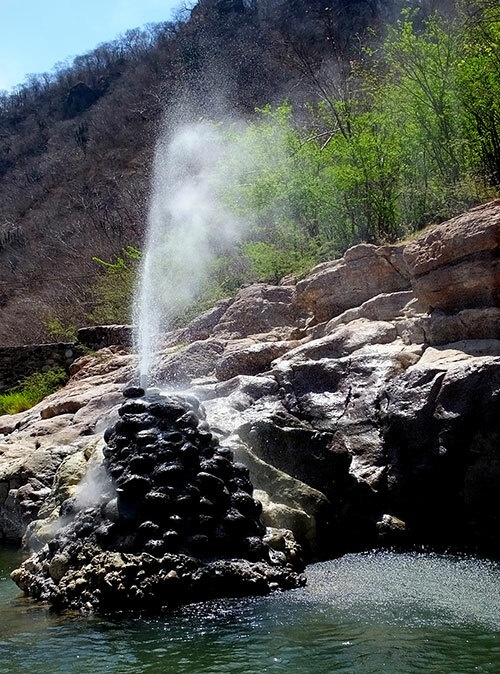 At the moment, this is the only geyser park I know of in all Jalisco, so don’t miss it! Take the western Periférico north to the Tesistán road. Exit the Periférico and drive northwest 8 kilometers to highway 23 heading for Colotlán. Drive 40 kilometers north, skirting the town of San Cristóbal. At N21.07634 W103.42088 you will see a sign saying Ixcamilpa. Turn left and follow the paved road nine kilometers to the geyser park (N21.11326 W103.44525). Google Maps will get you there from anywhere if you aim at Campamento Huixtlán, even though this is a totally wrong name for the Parque Ecológico… but that’s Mexico! Driving time from the Periférico: about one hour and 15 minutes.